BS10008:2008 is a British Standard created and audited by the British Standards Institute. The title for BS10008:2008 is ‘Electronic Information Management’ and outlines the best practice for the management and storage of electronic data including data capture, transferring electronic data between systems as well as hosting electronic data which means that physical data can be destroyed without fear of litigation. The Civil Evidence Act 1995 specifies that electronically captured and stored information needs to be ‘authenticated in such a manner the court may approve.’ Therefore for a scanned/electronic record to be utilised as evidence successfully, the company must be able to prove that the scanned/electronic record has not been handled poorly, tampered with and most importantly that the process of digitisation has been handled correctly as is deemed by the court. 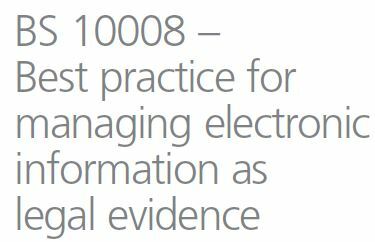 Certification of BS10008:2008 is a shining example of best practice, and more importantly, that electronic captured and stored information would prove to be unassailable in court. In addition to certification for BS10008:2008, DataSpace are formally audited and accredited by BSI for ISO/IEC27001 which is internationally recognised the best practice framework system for information security management of electronic data. BS10008:2008 compliments ISO/IEC27001 in that the implementation and monitoring of an information security management system (ISMS) will act as significant evidence in the demonstrating authenticity for your electronic records. In order to comply fully with BS10008:2008 DataSpace utilise secure internal systems that ensure full auditability and traceability of digitised documents from the point of collection through the complete imaging cycle to electronic storage. Additionally, to ensure compliance regular maintenance on scanning equipment and machinery, completing an audit trail of the scanning procedure for each document including who the scanning operator was, which scanner was utilised to capture the physical document and many other matters.